One of the biggest causes of diet sabotage? Getting hungry midday and turning to whatever foods you encounter. That's why it's so important to be prepared with what I call "emergency snacks." These are diet-friendly foods that can be stored in your purse, backpack, desk drawer, or mini fridge. They’re perfect for crushing hunger cravings! High-protein foods are satisfying but not all of them are smart choices or good for on-the-go snacking. 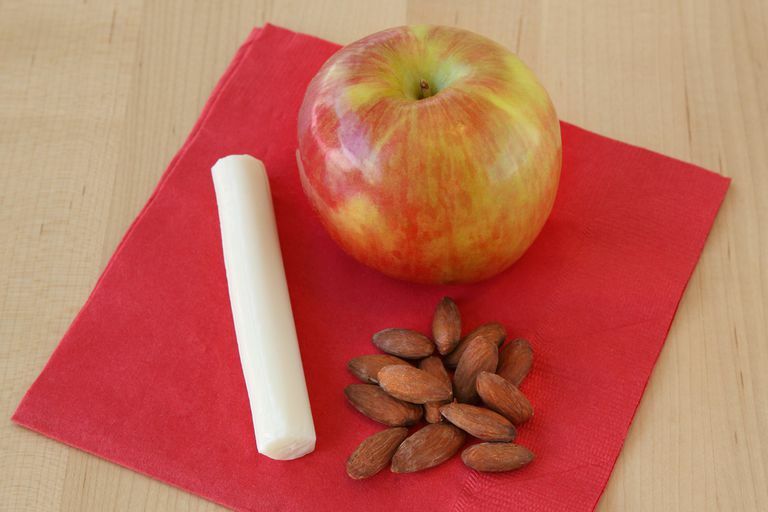 Plus, not many snacks are under 100 calories, but some of these are! Single-Serve Tuna Pouches: They're so convenient, you don't even need to drain them! Just be sure to get the kind packed in water, not oil. These are generally low in fat with 110 calories or less, and they're high in heart-healthy omega-3s. There are seasoned varieties and low-sodium options. Eat the tuna right out of the package or pile it onto rice cakes or high-fiber crackers. Snack Bars: The best protein bars pack in lots of fiber, too. I look for bars with 200 calories or less and at least 4 grams each protein and fiber. The sweet flavor is also great for keeping dessert cravings at bay. Rather than devouring three chocolate-chip cookies from the break room, reach for a chocolate snack bar. It's a diet-friendly way to kick your chocolate craving. Jerky: One of my favorite grab-n-go snacks is jerky. It's not the most popular snack ever, but it's generally pretty low in fat and calories. A 1-oz. serving typically has 100 calories or less and under 3g fat. Plus, it's not just made of beef these days! Look for chicken, turkey, and soy varieties too. Portion-Controlled Nuts: While nuts aren't quite as high in protein as the other items on this list, their healthy fats and fiber make them major hunger busters. Almonds and pistachios are my top picks. Look for 100-calorie packs or DIY: You can have about 14 almonds or 25 pistachios for 100 calories. A fun bonus with pistachios? Shelling keeps your hands busy and makes the snack consumption last longer. Be mindful of your snacking habits though. Don't go snacking from a multi-serving package of nuts. Portion them out ahead of time! Naturally occurring fiber should be high on your list of desirable traits for an emergency snack. Most people don’t get enough fiber so adding at least one high-fiber snack to your daily food consumption is a really good idea. These will do the trick. Apples: Each medium apple has about 100 calories and 4.5g fiber. If you're looking for the perfect combination of sweetness and tart flavor try a Fuji apple. Oranges: For about 100 calories and 3.5g fiber, have three clementines or two tangerines. Peeling them makes snack time last longer! Sugar Snap Peas: You can have 3 1/3 cups of sugar snap peas for 100 calories and 5.5g fiber. If you don't like the way they taste raw (they can taste a little "grassy"), lightly steam and then chill them. Jicama: This is the veggie snack for people who think they don't like veggies. Jicama tastes like a very mild apple or pear. Chomp on 2 1/4 cups of jicama sticks for 100 calories and a whopping 13g fiber. If you’re heading to the beach, to the park, or on a long road trip, bring along a small cooler and pack it with guilt-free snacks. These snacks are also great for office kitchens and dorm room mini fridges. Hard-Boiled Egg Whites: You can have three hard-boiled egg whites for 50 calories and 10g protein. I typically skip the yolks, since they're a little high in fat and cholesterol. Plus, removing them means you can add tasty fillings to the hard-boiled egg white halves: hummus, salsa, mashed avocado, you name it! Greek or Regular Fat-Free Yogurt: There are endless flavor options available, so you’re able to squash a craving for dessert and other sweets one spoonful at a time. Look for snack-sized containers (about 6 oz.) with 150 calories or less. The bonus with Greek yogurt is the impressive protein count, with at least 15 grams per 6-oz. serving. This snack is also an easy one to flavor up. Light String Cheese: I love light string cheese (there's something strangely satisfying about pulling apart your food) and it's only around 60 calories and 3g fat. Have it on its own or wrap it up in a few slices of the next item on this list. Extra-Lean Turkey Breast: Look for turkey slices that are at least 96% fat-free. If sodium is a concern, check the deli counter for no-salt-added slices. And turkey isn't the only protein available in extra-lean cuts. Look for chicken breast, ham, and even roast beef with 4% fat or less.